This is a PMI (Product Manufacturing Information). One small question "When checking: How do you markup a PMI?" Here is a video I saw a couple of years ago and commented. My first comment was posted and I got a reply from Oboe Wu, the SOLIDWORKS Model Based Definition (MBD) Product Manager. It seems like there are very few folks in these large 3D CAD companies that have real hands on engineering experience, yet they want take over our engineering process. Mr. Wu made one of the most uninformed statements I have ever heard from anyone in my 37 years being in 3D CAD. It happens about :47 seconds into the video. “We have to project the data down to the 2D drawing and then ask somebody else on the shop floor to, the supply chain, to reconstruct the 2D drawings into 3D". What do you think Mr. Wu means? Decades ago we worked with 3D wireframe models and place the views for the AIDs in 3D space put in a document format and compress the graphics to a 2D plane, but this was 31 years ago. Surly Mr. Wu must know that Solidworks has a documentation module that creates the AID (Associated Information Document) is delivered as a PDF along with the 3D model in a native or neutral format. We have been doing this for 30 years. That is the advantage of 3D, simple to create documentation. The 1990's - 3D CAD/CAM Moves to the PC!! In the early 1990s we were already delivering 3D models to manufacturing with complete documentation, I hate the word "2D Drawings", these were AIDs (Associated Information Documents). We would deliver 3D wireframe and surfaced parts by IGES. In 1995, solid modeling became available on the PC with CADKEY, Solidworks, IronCAD and all of the high end systems. We were then delivering solid models with IGES and STEP files. By 2000 all 3D CAD was on the PC, and many mid ranged programs could read the native files of all the popular programs. The high end systems dragged their feet trying to keep their users locked into their software. I think Catia still only exports IGES and STEP and it is optional. It is like having to order a steering wheel for a car. Catia is used by large companies with thousands of suppliers? How did they think they would talk to them. The 2000's - The Age of 3D CAD Un-Enlightenment! The above video was done in January 2015 not, 1990 or even 1995 with the release of Solidworks and a variety of other PC base and high end solid modeling systems. The 3D model was used as a pattern for manufacturing and as a .stl for stereolithography, 3D printing and images. The PDF was now widely available and we were then sending zip files with the 3D model in a native or neutral format and the AID as a PDF. This still is the most popular way of delivering the engineering documentation. Only the largest companies have enough money to waste on the failed PLM, MBE, MBD and PMI. Is the reason for this ignorance on one end or the other? Don’t the manufacturers know enough to ask for the 3D model? Don’t the design firms realize that is the reason they are designing in 3D. The comment strains all credulity. Boeing was delivering IGES or STEP files from the late 1980's. Here is my response to Mr. Wu. “The engineering world has been based on the 3D model for over 33 years. It is shocking to think that someone still thinks we use drawings only as the authorizing document. It has been the solid model “and” an AID (drawing) (first printed and now delivered as a PDF) for me since 1987. Here is his response. But this is not what he said in the video. He was probably educated a bit by this time. Sadly, he justifies his remarks with a self serving report from "Dassault, Solidworks and Siemens"
I have tried to respond to his answers two times and both times they were not posted. I am sure they do not want any negative comments made on this effort in their own blog. The complete 3D CAD world is full of vested interests and those that have no applicable knowledge. I will respond here. "Thanks for the comment, Joe. Sorry for my late reply. Great to see you are interested in MBD too. industry for a long time. It's fair to say that SOLIDWORKS contributes greatly to the migration towards 3D. We are good at it and proud of it. 1. In reality, 2D drawing is still a dominant communication tool. 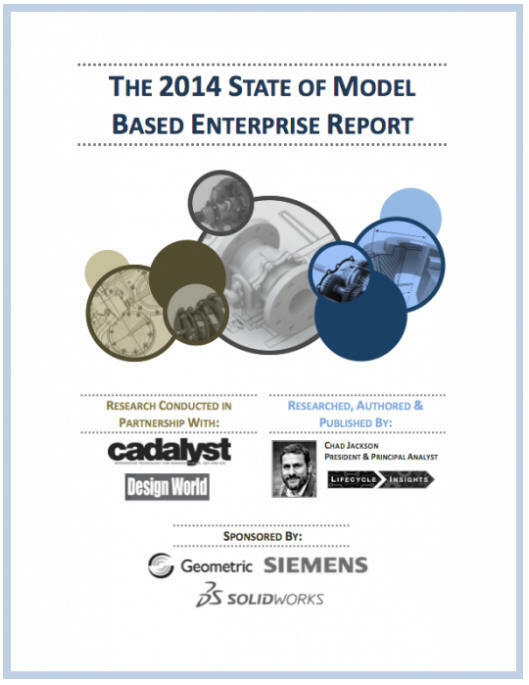 According to an independent research The 2014 State Of Model Based Enterprise Report by Lifecycle Insights, 98% of manufacturers release 2D drawings to certain extend (42% exclusively release 2D drawings and 56% release a mix). In other words, only 2% release purely 3D annotated model (Sample size: 575)." I have been actually been doing this for 33 years and this guy is going to explain it to me? I have always had a problem with someone saying “2D Drawings” in the age of 3D CAD. What other kind of drawings are there? Also there has never been a "2D drawing" made in Solidworks. Solidworks has a documentation module (it is silly calling them drawing modules since we don’t draw anything). What do we do in the documentation module? We detail (add dimensions) and other pertinent annotation to defined views of the model creating an AID (Associated Information Document). Why do I keep defining the AID? Because we do not make "2D drawings"! To prove the above statement, Dassault has an electronic drawing program call Draftsight to do real "2D drawings". Mr. Wu has had to learn about all of this from who? This was a study that was done by those with a vested interest and a defined outcome. This is a study that was sponsored by Siemens and Dassault Solidworks. Oh yes, we all know we can trust Siemens, Dassault and Solidworks to be concerned with our best interest. Who is Geometric? Oh, yes another company that benefits if we all move to MBD. MBE Model Base Enterprise is the name of this process. MBD is the application of this process. "2. In the mixed usage of 2D drawing and 3D model, the key question is: when there is a conflict between 2D and 3D, which one is taken as the authority? In a SOLIDWORKS base survey in 2014, 1/3 still respects 2D as the master over 3D. The good news is 2/3 take 3D as the authority (Sample size: 486), which is actually already level 1 or 2 per the NIST MBE Capabilities Assessment and lays a very solid foundation for Model-Based Enterprise (MBE)." Why doesn't Mr. Wu go out and visit Solidworks users! Survey's? Really? The model is always the authority. It is directly used as the pattern. The "drawing" is an AID (Associated Information Document). Truly, in today's 3D CAD world it is not designed to stand alone, even though it can in many cases. If there is a discrepancy between the model and the documentation we have to go back to the original designer for clarification. He/she will then correct the model or documentation. Completely defined documentation serves as the first check on the design for errors and another look at the design. But they are wasting their time. Engineering today is not managed by the knowledgeable engineering of the past. It is managed by PLM and InfoTech experts that have never sized a hole for a screw. Much less read or understand a drawing or a PMI for that matter. Again he has a complete misunderstanding of the process. Has anyone ever noticed that these academic types trust surveys instead of direct observation. Never thinking that the survey may be manipulated to show the results they wanted. But then, Mr. Wu works for the Solidworks that was part of the report. 3. Now regarding recreating 3D models per 2D drawings, in the same 2014 State Of Model Based Enterprise Report by Lifecycle Insights, it found out that 40% downstream procedures and suppliers have to recreate 3D models (Sample size: 575). Again he references a report written by a group that has a vested interest in promoting MBE. Lifecycle insights are run by a bunch of PLM gurus with no applicable engineering experience and cater to the major CAD vendors. This is 2014? I just cannot believe that 40% of the industry can be this ignorant. Again, if he went out and visited the Solidworks users he would have found this out. But remember only machined parts and sheet metal use the 3D model. Most fabrication, that use other purchased compoments rarely even need a 3D model. The model is used to create the documentation to define the cuts on tubing, wood and other standard shapes. 3D printing does not use the 3D model as a pattern it is the 3D model. I have been hired to create the 3D parts of a propeller for a torpedo, because they couldn’t find a machine shop that would not do it from the drawing and demanded a 3D model. "4. Onto your last point “drawing is an easily generated reference document that requires no special software to view.” Drawing may be easy to generate on an individual basis, but when it comes to massive amount of documents to create, update, and manage, drawing is not so easy. In an MBE conference 2 years ago, a representative of U.S. Department of Defense estimated 1/3 of their engineering dollars were spent in creating and maintaining 2D drawings, yet 60% of them didn’t match 3D design. These numbers are confirmed by several other enterprises. As to “no special software to view” drawings, if you referred to paper copies, that’s true, but that adds to the manufacturing overhead. Sometimes the paperwork to define a ground combat vehicle is even heavier than the tank itself; If you referred to 2D drawings PDF, then the same holds true to MBD deliverable. 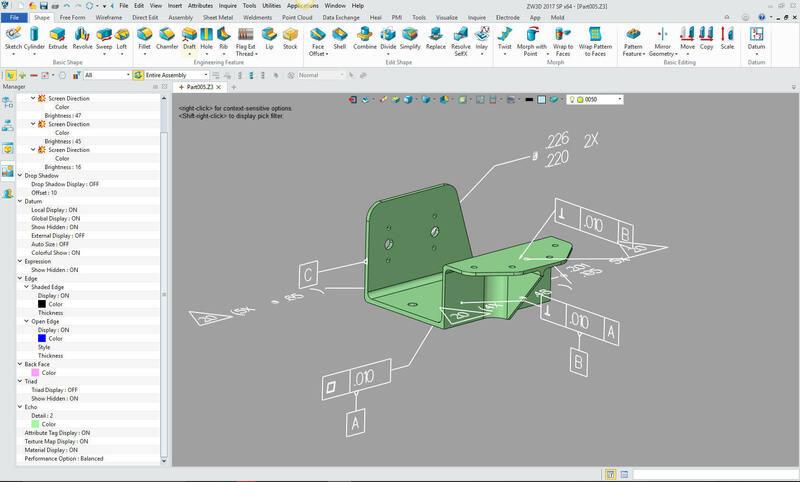 SOLIDWORKS MBD can generate PDF with dynamic 3D content such as models, dimensions, tolerances, bill of materials, customer properties… All needed is a free Adobe Reader to view the 3D content, which is already installed on 93% of internet-connected computers." Just because the AIDs (drawings) require synchronization, you don't throw out the baby with the bath water? How do they know whether the model or the documentation is correct? Initial release is a review of the document only, how do you do it with the model even if you have the obscure PMI. It is the proof of the part. When making changes you need the document to record the changes. It is a step in engineering to assure a defined path for any future problems. I am sure in the future Boeing will have huge problems working with the PMIs. Also how do you mark up a PMI? But this shows his complete lack of understanding about engineering documentation. With the elimination of the draftsman, engineers are moving into the position of delivering the engineering documentation. An AID (Associated Information Document) is very easy to generate. They are not aware the delivering concise, complete and unambiguous documentation to manufacturing is its only purpose. and unambiguous documentation to manufacturing. A single drawing like document delivered as a PDF and the model delivered in a usable format is the ultimate engineering deliverable. I takes no special software to read and it is easy to store and be available to the other departments in the company. What do they mean by paper? The documentation is stored as a PDF. Yes, manufacturing, purchasing, engineering and legal may print them, but only to work with them not to store them. It is surely better than looking at a computer screen for your specs. Also if you follow through the way Solidworks is presenting the PMI it is supported with a set of different confusing forms instead of an easy to view "drawing" like standard PDF document. That is where this all falls apart each CAD system has its own unique engineering documentation solution. It is a bit strange that Dassault keeps Catia and Solidworks completely separate. You would have thought they would have tried to merge the two products years ago. NX has the same problem with Solid Edge. We really need to get the engineering documentation deliverable out of the native CAD system. Creating a completely defined document from the 3D model is very simple. It gives the designer a second look at the design for errors or even a better design. It is in a user-friendly format for design review and checking. It provides a document that can be viewed and understood by anyone with an engineering back ground. I even believe we could make these documents more informative. They are delivered in the convenient flexible PDF. Mr. Wu has never done a drawing or even a 3D model. Yes, he has incredible academic credentials. But mostly in software assurance. Why would they put a fellow with virtually no hands on experience in engineering documentation in such a position. He has no clue what is important and what is not important except for reading some obscure studies. the responsibility of the Drafting group! I have spent many years in drafting rooms and I never saw one MSME or PHD. This guy is from Harvard. Harvard? I never met anyone from Harvard. We did have a few P.E.s, they walked on water, they were there to bless our project. As for delivering a special PDF as your engineering documentation, that is very time consuming. You would have to create a special pdf for every part. Every time you send something out for quote you have to generate a PDF. That is why NIST, in the following article, is trying to figure a way to read each of the major 3D CAD programs native files with PMI. Here is a NIST study trying to find a way for each of these different systems native files to be compatible. Instead of creating a standard that all CAD systems have to conform. Done by who? Nope, not one of these fellows works in design engineering doing design or documentation. It truly is quite bizarre, it is like they go out of their way to avoid engineering professionals. But the future of the BSME is nothing but glorified a "draftsman"
This article shows the complete lack of understanding of the simplicity of the "drawing", much less than the concept of the model and PDF associated information document. If you can just get through the acronyms you may be able to understand what they are trying to do. So, there you go. Is Solidwork really delivering a viable solution or just going along with the flow to promote a virtually unworkable solution locking its users into their product. Now this is not to pick on Mr. Wu. I doubt the he even wrote this reply. It is to show those of us that are engineering professionals working daily with 3D models creating our AIDs (Associated Information Documents (assuring that they are correct, concise, complete and unambiguous)) are not the people that these companies are putting in charge of the processes what they are trying shove down our throats. Here is a comment by one of my Linkedin contacts that is forced to work with MBD. "The big problem is, any failure will be blamed on the responsible engineers and not an unworkable system. MBE is already being backstopped by drawings in many organizations that are forced to use MBE, but the drawings are frequently not in the release control process because they are not the "primary" data driving fabrication. A fine mess.."
It is time to put engineering back in charge of engineering! Now this leads me to these articles. provide engineering services throughout the USA and Canada! With 50 years of experience in engineering, 17 years in manual board design as a contract engineer, 33 years in 3D CAD sales, support, training and providing engineering services, I have a high level of understanding of today's 3D CAD engineering world. For many it is in chaos. If you are having problems or just interested in this subject please feel free to call and we can discuss them. There are so many simpler solutions available that will save you time and money. My First 17 Years or "How did we do it without 3D CAD!" Please visit our Viewpoints for more interesting articles.